Nice work! You did better than 100% of people. Your average speed was 0.8 seconds. I got 30 out of 32. Would it be cheating to take the test again? I got 30 out of 32, but I was guessing on many samples. I might do better or worse with another run at it. Glenn, I agree. I was a bit disappointed that they all started on the same note. It's a scientific study. Starting on different notes would complicate the results. I took it twice, once with phones and once with speakers, and got the same score both times. Pretty bad (27 of 32). The close ones were guesses, I confess. I guess my pitch recognition isn't as good as I thought. Don't feel bad b0b . My wife took the test and got 20 out of 32. Better than 5% of the other people. But I knew she was tone deaf. I wonder if maybe tone deaf people just can't tell which octave a tone is in. That would really mess them up in a test like this. I've heard you play on recordings posted here and for my money your intonation is awesome, so I expect your ears are up to snuff. Now for me, so far this has been a test of my computer incompetence since I can't get it to run. b0b, I watched my wife pick obvious wrong choices. I think all of us of a certain age have trouble with the fractional intervals that were very close. My wife would hear a sound that was obviously higher, but picked lower. The brain is strange thing. Biggest problem is, she loves singing. I got all 32, I guessed on one and got lucky I guess, but I answered what I heard on the rest. I have fairly bad tinnitus, I was wondering what effect it has on my tonal acuity. Perhaps not much, at least within these limited parameters. I did it with headphones and was definitely aware of the ringing throughout the test. I wonder how many cents difference the really really narrow intervals are -- maybe 5 or 10c? Here is another test for y'all to try -- it tests how well you can discern a 5 cent difference between tones. 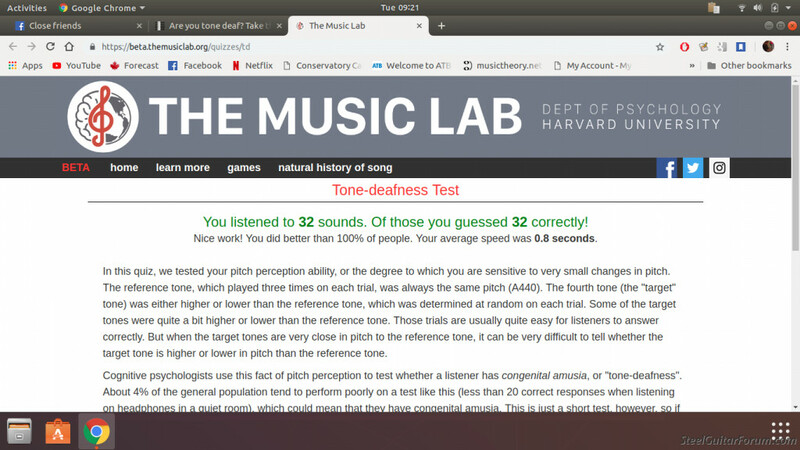 This is much harder (for me at least): https://www.audiocheck.net/blindtests_pitch.php?cent=5. You can set it to test different intervals too, between 1c and 50c. I hadn't done this one in a couple of years so I just tried it again. At 20 cents I still get 10/10 every time; at 10c I get 9 or 10/10 consistently. At 5 cents it's largely a guessing game, though I can definitely hear the pitches that go sharp easier than the ones that go flat in this test, but not every time. I see a lot of forum threads where folks are whining about 3-4 cents cabinet drop. I assume it's because they can see it on their tuner, not likely because they can actually hear it accurately. They must also have super human bar accuracy when they actually play. Moving/rolling the bar the equivalent of the thickness of a credit card at around the 7th fret is equal to about 5 cents change in pitch. Take the test above and tell me how clearly and consistently you can hear 5c. These are pure steady tones, vs. guitar strings which actually skew slightly flat between when they are plucked through their decay. Very interesting, Ian. I must say I couldn't hear the 5 c. difference and I thought I'd be able to. (After 4 stabs at the test, my confidence level was 19.75%, meaning random guesses would be more accurate than my ear. I wish the results wouldn't tell me I "GUESSED 30 Correctly". I didn't GUESS on those at all. The two I missed, yeah, those were guesses because I didn't hear any difference. I missed three. They were all in the tone UP or DOWN section. For these 'missed' tones I could not hear a difference, so I apparently guessed wrong. I have to wonder if that is due to my hearing or whether others had similar difficulty in determining for some tests the Up/Down pitch. Or were they all obvious for other people. "...i woke up not dead again today..."
You guys are really something. Let me know when you're songs hit the radio. Nice work! You did better than 98.19% of people. Your average speed was 0.9 seconds. Surprising for a guy pushing 72. Try as I might, with only two notes to go on, I couldn't recognize any of those songs. They were all the "One Note Samba", just bad performances. I couldn't get a peep out of it, not even the first tone where you set the volume.